If you have a listening room with a hard surface floor and ceiling, our Coffered Ceiling may be exactly what you need to help control secondary reflections without turning down the volume. Typical rooms which benefit most from this product have large areas of glass windows, hard surface floors and sheetrock ceilings. When sound builds up in your room, vertical reflections quickly fill the room with too many reflections. At ASC, we specialize in high end audio listening rooms, and have specified the Coffered Ceiling for countless well over one hundred acoustic projects. 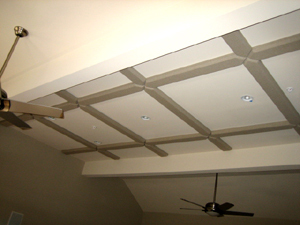 ASC's Coffered Ceiling is featured in the March '07 issue of The Trowel Magazine. 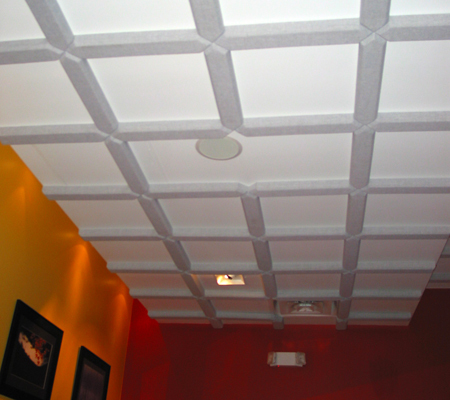 "Sound grids, like the coffered ceiling system, look good and sound great. The grid pattern is adjusted to fit between HVAC, lighting, sprinklers, security and sound and ends up looking like the whole ceiling was architect designed as one integrated system. Installation is easy with acoustic tile adhesive. And the cost fits right in to the room acoustic budget line." 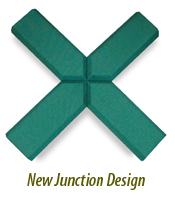 ASC has developed an easy to install "X" junction to adjoin grid segments. Each order is customized to avoid existing ceiling fixtures such as lights and HVAC vents. © 2010 Acoustic Sciences Corporation. All Rights Reserved.